Did you miss out on last spring's lambing season? Not to worry! You can catch up with all that baby cuteness right here. 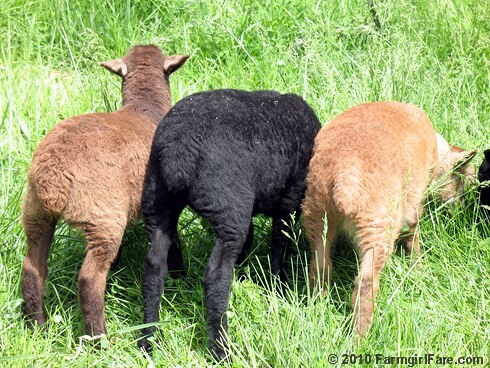 © FarmgirlFare.com, the technicolor foodie farm blog where I think I just might love the brown sheep even more than I love the black ones, though sadly all three of these lambs' coats have already started bleaching in the sun. Beautiful colors and nice builds on those lambs! What an inspiration reading your site. Can't wait to expand my homestead gardening on a larger piece of land someday! Why Susan - with all your spare time (laughing hysterically) you should make little sunshade outfits for the sheep so their wool would stay colorful. Great picture and your sheep look so healthy. Hoping you and Joe are healthy too! where in misouri do you live? I travel through there a lot and I live in arkansas. most of my amish friends live in seymore area and some in illnois too. mostly i have minnitte family ion AR, MO, and ILL.